The pupilary membrane is a fetal structure that covers the pupil prior to birth. It is supposed to resolve (go away) shortly after birth. Sometimes part or all of it will persist. 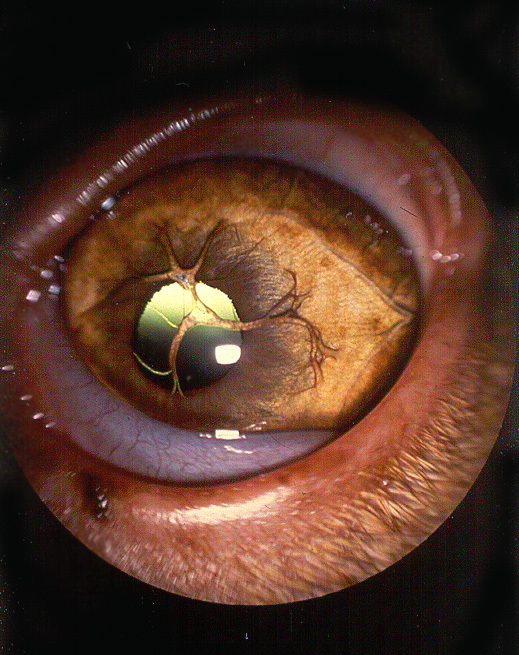 This is called a Persistent Pupilary Membrane(PPM or, in Europe, MPP). Most PPMs do not cause significant visual deficit, however some, particularly those that attach to the lens or the cornea, can cause blinding opacities. PPM which has not resolved (gone away) by the time a dog is a year old is hereditary, though the mode of inheritance is unknown. PPMs are not a major concern in young puppies. Sometimes minor developmental delays will result in portions of the pupilary membrane remaining longer than normal. These do not pose a problem to the dog. A puppy with a PPM should be re-checked in 6 months to a year. If the PPM has resolved by one year of age, there is nothing to worry about. The American College of Veterinary Ophthalmologists (ACVO) does not consider iris-to-iris PPMs to be significant and they will pass a screening exam with a notation. However, those that attach to the lens or cornea can cause sometimes blinding opacities of those structures. These types will not pass a CERF exam. You should not breed any dog with a PPM that attaches to the cornea or lens. If you breed dogs with other types of PPMs, it would be best if you do not breed them close on their own pedigrees or to mates who have a recent family history of PPM.